﻿The Alchemy of Chaos comes out next week, so let's unlock a new excerpt from the book. In the past month one thing had become perfectly clear to Lieutenant Benvin: he was the only person in Maradaine who gave a damn about how he did his job. Captain Holcomb was comfortable in his office, and couldn't care less what Benvin did to crack down on the gangs in the streets. If nothing else, he was grateful that Holcomb’s laziness was complete: he honestly didn’t care one way or the other what Benvin did. At least the man wasn’t obviously corrupt. That couldn’t be said for most of the other lieutenants or patrol officers in the Aventil stationhouse. He wasn’t sure any of them were truly getting bribed. From what he had seen of these Aventil gangs, they weren’t really in a position to bribe anyone. But something was motivating them to stop him up whenever they could. People in the neighborhood were no better. There were the gangs, of course. But the rest of the people didn’t just tolerate them, they embraced them. Someone had a problem, they didn’t call Constabulary. That was the last thing they wanted. No, they called a Rose Street Prince or a Waterpath Orphan or some other damn waste of space. Some of the patrolmen got on board with Benvin, at first. Though it became clear that for most of them, it was about the thrill of cracking street kids with their handsticks, shaking them for coin, getting kicks off the girls. No better than the gangs, just green and red were the colors they wore. Benvin had no use for those folk. So he narrowed his squad down to five solid patrol officers and two cadets. The ones he could trust. The ones who did it right. The ones who had been shut out by the rest of the stationhouse. He made them his own. It wasn’t much, but it was all he could get in Aventil. Saints knew none of the district commandants or even Commissioner Enbrain were going to send anything else his way. Didn’t matter. Benvin was going to do his job, and do it right. He’d dismantle every gang in this neighborhood and it clean it up. Starting small, with the Red Rabbits, just to show everyone he could do it. Tonight wasn’t for the Rabbits, though, not directly. He planned to shut them down first, but he couldn’t make them the only thing he focused on. Tonight they were going to crack open the cider ring the Orphans were running. Sure, it was a tick-and-pence scheme, hardly worth the trouble. But that was why he wanted to crack it. No scheme, no ring, no crime was too small. So Benvin sat with Jace, one of the cadets, in the wagon on the northwest corner of Cantarell Square, watching with the scope. Arch, Pollit, and Tripper were in the square, waiting for their meet, and the rest of the lads were in place so they could move in. The targeted Orphans were approaching the square with their handcart of contraband cider. And then someone yelled “Rose Street!” and it all went to blazes. It took Benvin a moment to fully realize what was going on, and by the time he did, the Orphans were clearing out. Pollit and Tripper charged after them, while Arch just looked confused. But the real action was across the square, where the Rabbits were having a brawl. A full-on brawl. With whom? The Princes? One Prince? Benvin leaped off the cart and blasted his signal whistle as he charged across the square. By the time he was halfway across, Arch had come up behind him, running for all he was worth. “Thorn?” Arch asked, heaving for breath. 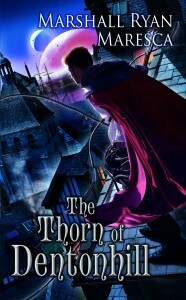 “Thorn,” Benvin hissed back. That word was written on the top of their slateboard by Benvin’s desk back in the stationhouse, in big letters and underlined several times. The Thorn disengaged from the group of Rabbits, firing a wild arrow to get them to scatter. He took two steps toward Cantarell Square, but then changed direction as soon as he spotted Benvin and Arch. Arch drew up his crossbow and fired, but missed wide. And then the Thorn suddenly faded out of sight as he ran. He tore after the shimmer, pulling up his own crossbow. The shimmer was still moving down the alley, as fast as a man running would. Benvin shot his blunt-tip at the shimmer. The blunt-tip made contact, and with a cry, the shimmer turned back into a cloaked man. He stumbled his way down the alley, giving Benvin a chance to reload his crossbow and close the distance. “Hold fast and be bound by law!” he shouted, as the Thorn turned on his heel and drew up his bow. 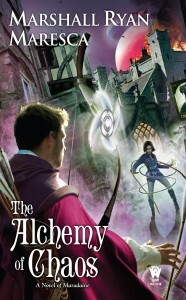 THE ALCHEMY OF CHAOS releases on February 2nd. Sometimes I feel like I got to a bit of a late start with this-- I'm 42 years old, and my writing career is just getting started. A lot of other folks my age have been in the trenches for years. But my path has been my path, and I needed those years to learn how to write, to learn how I write. That's been a long, hard process, and while it's paid off, I wonder what message I could send myself to help ease that process. I think the thing I'd tell myself is that there is no "how you're supposed to be writing" as defined by someone else. Be it a pace set by NaNoWriMo or that one needs to use a specific formula to craft a story or answer these questions about a character... that there is no the way and part of the journey is finding your own way. "But, Marshall," you might say, "You're often going on about your twelve-part outline structure. Isn't that you telling people a the way as well?" Well, no. I try to take care to say, "Hey, here's a thing that I've come up with that helped me write outlines, maybe it can help you as well." It's a tool in my toolbox that I like to point to and say, "You want to borrow that? It's cool if you do." But I never say THIS IS HOW YOU MUST OUTLINE because that's not helpful or useful. I never even say YOU MUST OUTLINE because while that's something that is critical for me and my process, that isn't a universal. Plenty of great writers don't outline. Now, I could, conceivably, tell me younger self, "You would do better outlining and here's a twelve-part structure you can use and setting a pace of 500 words a day will probably work best for you in the long run. Have fun!" But I suppose that would undermine the process of learning and mistake-making that got me there in the first place. So maybe instead I'd tell myself, "You're going to make mistakes. And you'll learn from them. So be ready to learn from them." I may also say, The Thorn of Dentonhill and The Alchemy of Chaos are going to have sweet covers, you're really going to dig them. And younger me will be all, "The huh of what?" because I hadn't come up with that stuff yet. All right, time to admit something: I thought this would be easier this time around. I mean, I've done the Book Release thing twice, so this run-up to release day should be old hat by now, right? One thing I realized, looking back at the run-up to The Thorn of Dentonhill is how I avoided the S-word. I referred to Veranix as a "magic-student by day, vigilante by night", but I didn't really say "superhero". But I had to come to terms with that as Veranix's story. 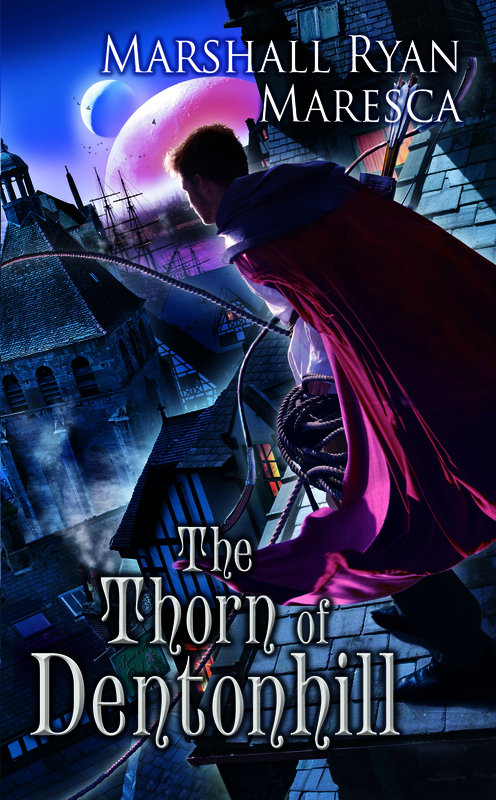 The Thorn of Dentonhill was very much about Veranix going from being an angry kid with power to being "The Thorn". The Alchemy of Chaos is the next step in that journey-- Veranix coming to terms with what being the Thorn needs to mean. In Thorn he realized he had great power. In Alchemy he learns about great responsibility. THE ALCHEMY OF CHAOS comes out in two weeks, but eArcs are available at NetGalley if you have access. Pre-order at Amazon or Barnes & Noble. Add it to your to-read pile on Goodreads. *- Which is why guys like Green Arrow and Hawkeye exist. So, now that we're firmly in the new year, it's time to set some professional goals. What will I accomplish? Slight problem: I have some rather specific goals that I can't properly talk about yet. So I'm going to have to be vague. Sorry about that. When I can be not-vague, I will scream to the hilltops. But for today: vague. First, there will be the things I have coming out in 2016. 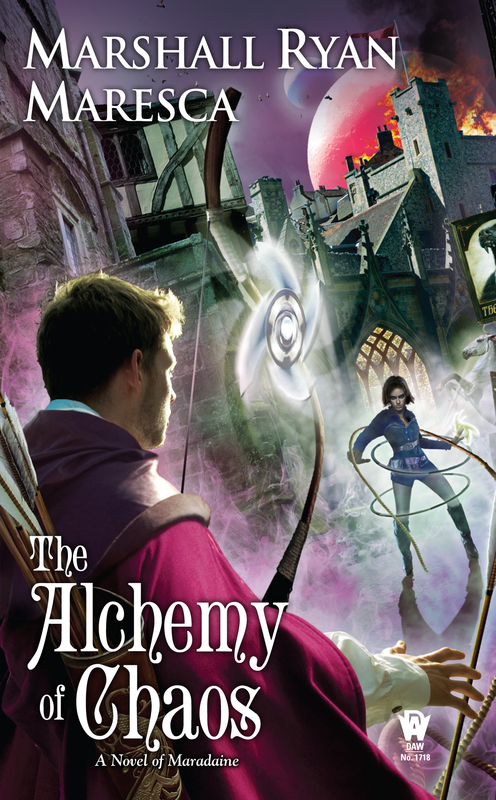 The Alchemy of Chaos, of course, comes out in a few weeks, and the second Maradaine Constabulary book, An Import of Intrigue, comes out in November. So that right there are two big things. Polish "Manuscript X" and turn it in. Finish draft of "Manuscript Y", edit it, and turn it in as well. Finish draft of "Manuscript X2". Polish outline of "Manuscript Z" and get started on it. I'm attending ConDFW in February, and running the Writers' Workshop for ArmadilloCon in July. I do not, as of this writing, have any other con appearances scheduled, but I intend to get a few more on my agenda. I would like to include WorldCon in Kansas City among them, but I can't commit to that just yet. Honestly, at this point, I really don't know. But, let's be real: that writing schedule, combined with the release of two books, is pretty breakneck. I need to remember to to keep things like copyedits and proofs in the schedule. My point is: it's probably best if I don't spend too many weekends going anywhere. So that's what I have. In December, we'll check back over here and see how I did.